We spent some time recently with Chris Woehrle to learn more about beef jerky and the history of his company. 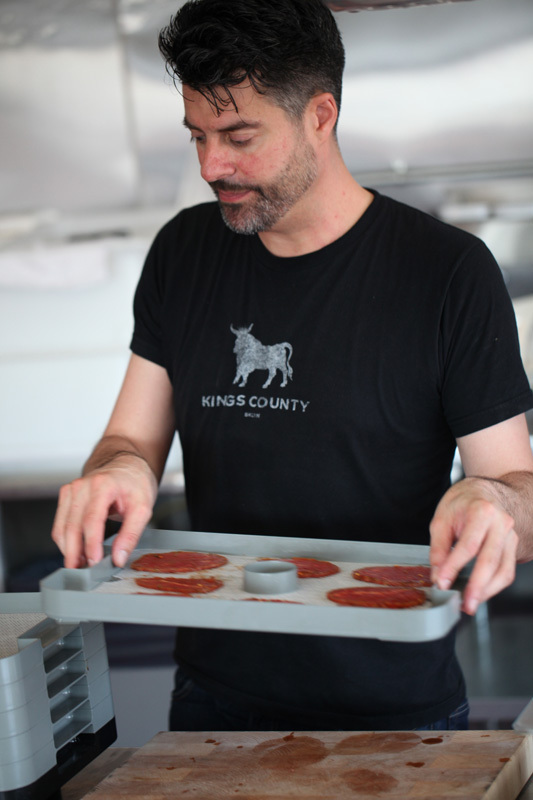 Chris also shared with us his excellent recipe for making Kings County Beef Jerky right at home. We can’t wait to try the recipe. But if you don’t want to be a “jerk about it,” you can easily pick up some bags in our pantry. Kings County Beef Jerky in Cracked Pepper and Korean Barbeque flavors in our Manhattan Fruitier pantry. MF: How did you guys get into the business of making beef jerky? Chris Woehrle: We were eager amateur cooks and food lovers intent on starting our own food business. We wanted to do something unique, and realized that beef jerky (a favorite road trip snack of ours) was ripe for reinvention. By replacing feedlot beef and artificial ingredients with grass-fed beef and all natural spices, we realized we’d be doing something new. After a few months of perfecting our recipes, we entered a competition for new food brands, where we won the Audience Choice award. The judging panel of food business luminaries told us we had an excellent product that was worth pursuing. The next day we started the search for a kitchen space and never looked back! Why is it called “jerky”? The word “jerky” is derived from the Spanish word charqui, which is itself derived from the Incan Quechua word ch’arki, which means to burn (meat). From a health standpoint, what are the benefits of eating beef jerky? Jerky is in fact a very healthy snack, particularly the way we make it. Grass-fed beef has a number of health benefits like omega-3s that grain-fed beef does not. It is also much leaner. We hand trim the beef of any visible fat, and use a light touch with salt and sugar, so our jerky has much lower sodium and sugar content than most other jerkies. It’s an excellent lean protein, low fat, low carb snack. What is the cut of meat that starts the process? We use the leanest cut of beef, which is the top round. It’s mostly lean muscle with very limited fat content. 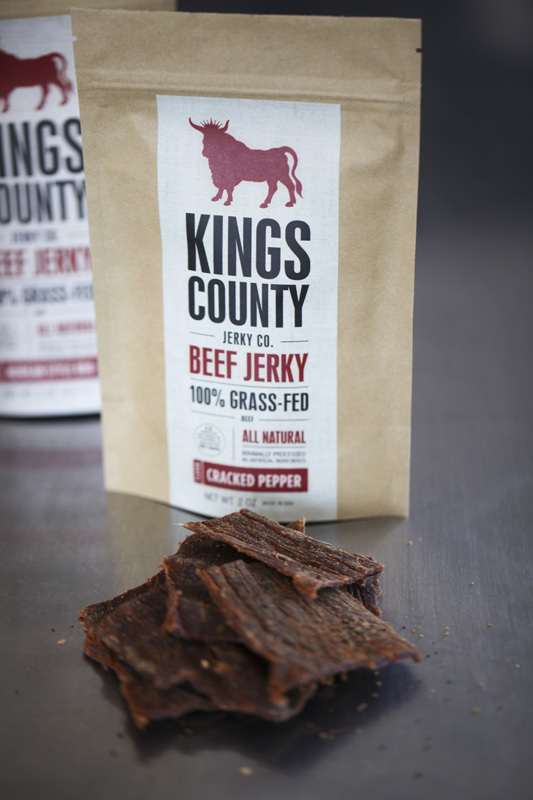 Top round grass-fed beef makes the best beef jerky from Kings County Beef Jerky. Do you cut across the grain or with the grain? We cut with the grain to give the jerky its characteristic chew. Cutting against the grain causes it to be crumbly. Where does your beef originate? Can you share with us a little bit about the farm and cattle? We used to source our beef from a single family farm, but as we grew, they simply did not have the capacity to supply us. We now use a broker who sources 100% grass-fed beef from a number of different farms. Our number one requirement is that the beef be 100% grass-fed and naturally raised, free from hormones or antibiotics. How many pounds of beef does it take to make a pound of jerky? What’s your process for creating new flavors? I get inspired by a number of things: cookbooks, restaurant meals, spice shops. 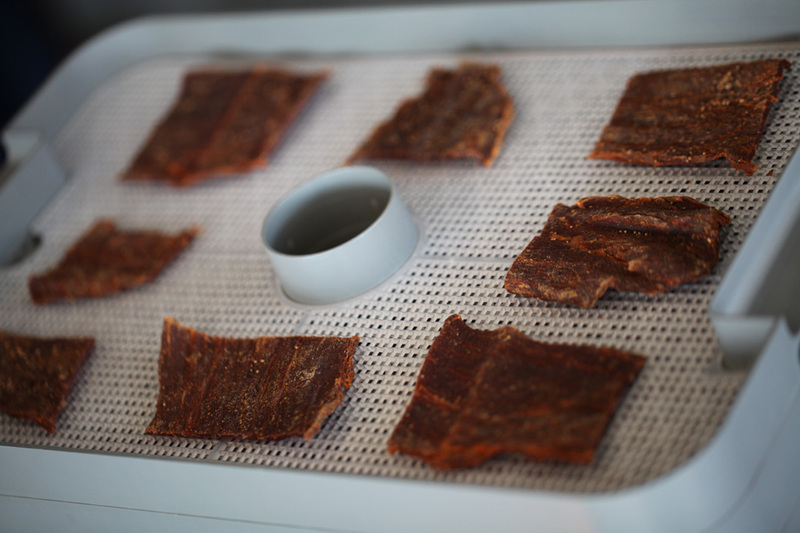 I experiment with marinades in our kitchen and test small batches of beef in our tabletop dehydrator. Do you brine or marinate your jerky? We use wet marinades for all of our jerky. We use tamari (a wheat free soy sauce) in our marinades, so we don’t add any salt. 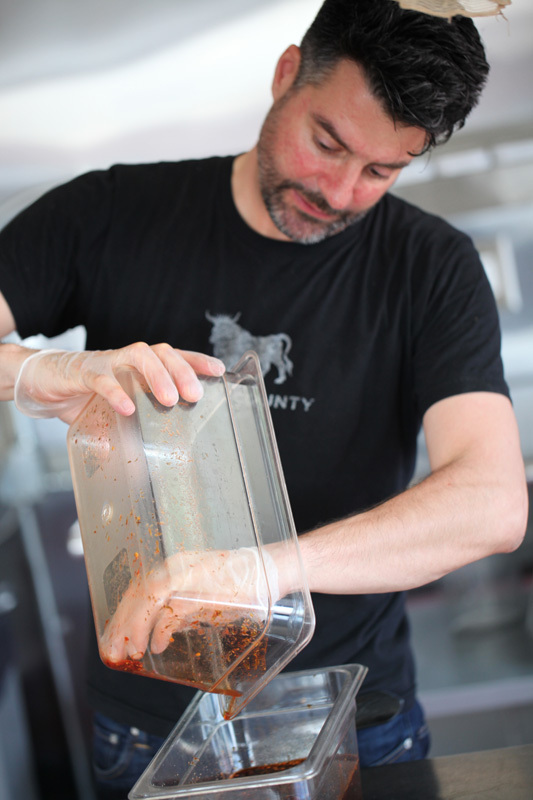 Mixing the marinade at Kings County Beef Jerky. What is your drying process? Air? kilns? It is dried with a combination of low heat and fan-driven air. Have you considered using wild game for your jerky like venison, elk, buffalo, kangaroo, etc? USDA regulations prohibit the use of wild game for commercial jerky, so all animals must come from a farm, which limits what meat we can use. 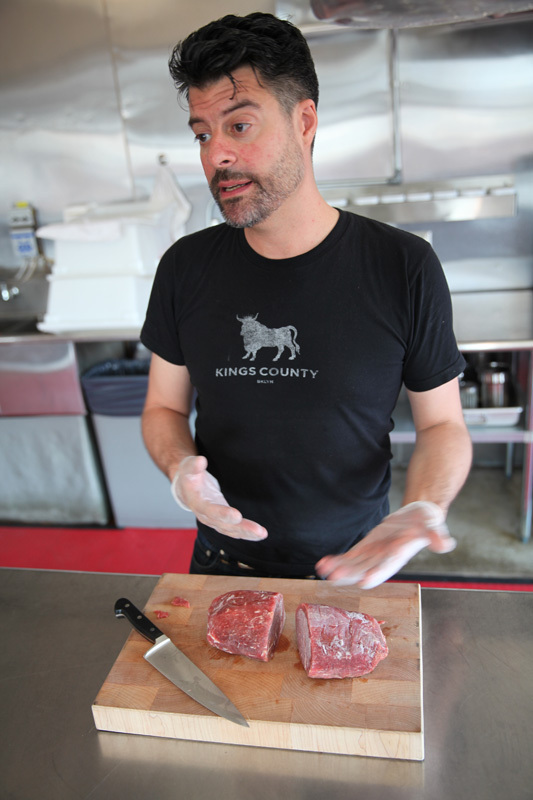 Kings County Beef Jerky uses low heat and fan-driven air to make their beef jerky. Can you describe why there was a sea change in our view of jerky — it went from the thing you’d avoid at a gas station to one of the best artisanal snacks made in the country right now. Why do you think that is? I like to think we contributed to that. We were the first to use a unique combination of 100% grass-fed beef, global flavors, and an attention to packaging and branding that hadn’t been seen before. Our small batch, handcrafted approach treated jerky like a charcuterie product instead of a mass manufactured junk food. You’ve had some impressive reviews in the press and on your website and ours. Have you gotten any feedback from ‘old-timers’ who were making jerky before you guys made it cool? We hear from guys who’ve been making jerky for a while and they’ve all been enthusiastic and complimentary about what we’re doing. Any advice for budding jerky makers? Making jerky for commercial sale is a different story – it’s a very challenging and expensive process because meat production is so highly regulated. Make sure you do the research on what exactly it takes before embarking on any kind of business venture! Strips of beef jerky from Kings County Beef Jerky after the drying process. Do you see your company, your product, being on nation-wide grocery shelves, or are you wanting to stay high-end and selective with your consumer base? How far do you want to take Kings County Jerky? Because our high quality ingredients are expensive, we have a higher price point than the mass-market jerky at grocery stores. The only way we can compete in the mass-market is by lowering our price, which means using cheaper ingredients or shrinking our margins to a dangerously low point. There is a big enough market among specialty food stores and online customers that I think we can take Kings County a long way without relying on nation-wide grocery stores. What’s your most popular flavor, and why do you think that is? Our most popular flavor is our Cracked Pepper, which is our spin on traditional jerky. People seem to gravitate to the familiar, classic flavor profile. That being said, our Korean BBQ flavor is a very close second in popularity – I’d consider that one our signature flavor. Top round beef, thyme, paprika and red chile flakes are the main ingredients in Chris Woehrle’s homemade jerky recipe. Recipe by Chris Woehrle of Kings County Jerky Co. Put beef in freezer for about 2 hours, until firm but not frozen solid. Remove meat from freezer, and using your sharpest knife, trim off any fat and silver skin from the meat’s surface. Next, decide if you want to cut the meat with the grain, or against the grain. By cutting against the grain, you will get a much easier chew. By slicing with the grain, you’ll get more of a classic jerky “pull” when you chew. Next, slice the meat into the length and width you want. Size and shape isn’t important, but thickness is. Aim to slice the meat at about an 1/8” thick. Combine the non-beef ingredients into a mixing bowl and whisk together. 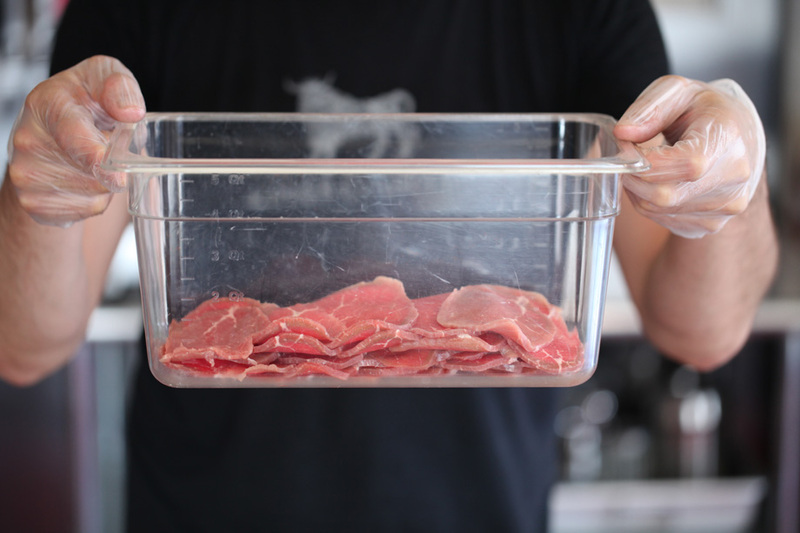 Place beef slices into a heavy-duty zip seal bag or glassware bowl or baking dish. Add the marinade to the beef and mix to ensure even coating on the beef. Place in refrigerator and let marinate 2-3 hours or overnight. When you are ready to dry the jerky, remove it from the refrigerator and allow to come to room temp – about an hour. Meanwhile, remove your oven racks and line your oven bottom with foil. Set your oven to its lowest setting. You want it at 175 degrees, so you will have to prop open the door with a wine cork or ball of foil. Use an oven thermometer to monitor the temp. Coat oven racks with non-stick cooking spray or a neutral oil. Remove your beef from the marinade, and lay the strips out on the racks, leaving some space between them so they are not touching. Place the beef-laden racks into the oven and cook until dry, about 2-5 hours. Keep an eye on your oven temperature to make sure it doesn’t go below 175 degrees, and after the first hour and a half, bend a beef slice with your finger to test for doneness. You want it dark and dry but flexible – not brittle. Continue testing until it feels done. Keep in mind that the heat distribution in every oven is different, so the jerky will not all be ready at the same time. 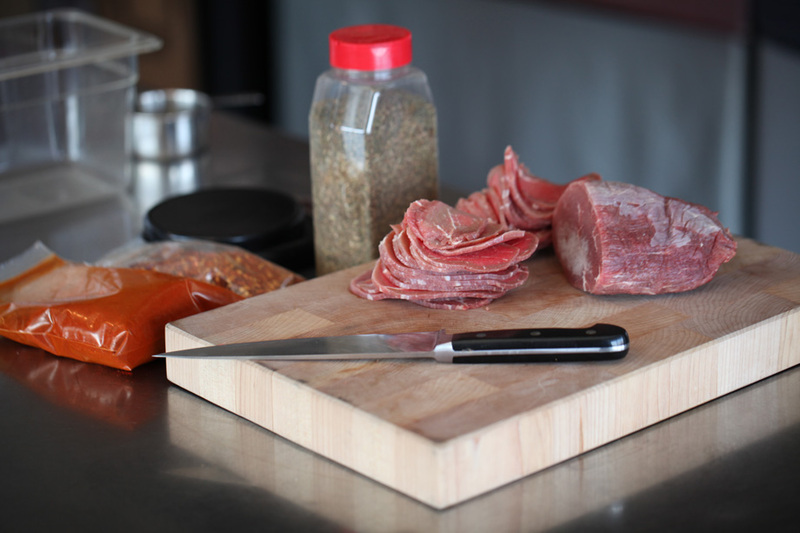 Allow finished jerky to cool on your counter, then store in an airtight container in a cool, dry place. Jerky is good for 2-3 months. 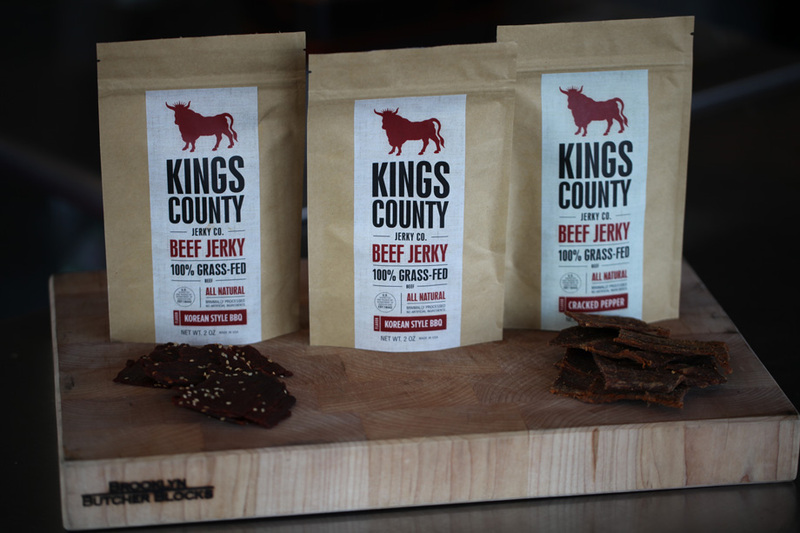 You can save this recipe for a rainy weekend at home and order Kings County Beef Jerky right away in our NYC Pantry gift or our Barstool Snacker gift pictured here. 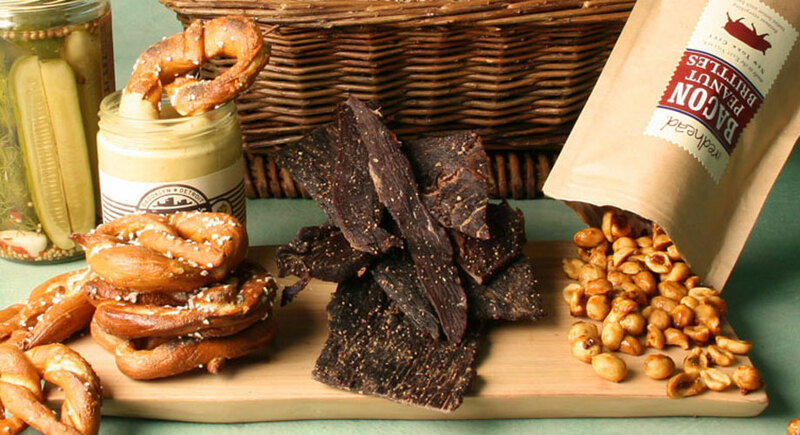 The Barstool Snacker from Manhattan Fruitier features Kings County Beef Jerky, The Redhead Bacon Peanut Brittle, Uncle Jerry’s Pretzels and Tin Mustard from Brooklyn. This entry was posted in Maker of The Month, Recipes. Bookmark the permalink. Kings County Jerky is actually out of business now. Instead, we’re now selling Brooklyn Beef Jerky. You can order it by calling us at 800.841.5718. We can have it delivered anywhere in the continental USA – including Indianapolis and Florida.